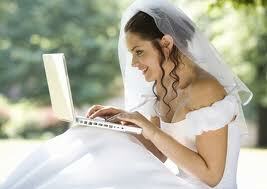 Wedding Website: Does every bride need one? Do you have a wedding website? Why? Struggling to answer the question? Read on. Nicole Ames, a professor of Integrated Marketing Communications and owner of Twist IMC, says that many companies create a Facebook page or a Twitter account for no good reason. Often, their response is “because everyone else is doing it.” Business-savvy women know that doesn’t make for an effective strategy. Let’s bridalize that concept. If a bride is creating a website because everyone else is doing it, she is also creating it for the wrong reason. Business-savvy brides have constrained resources including limited time and budget. She shouldn’t waste precious resources on something that doesn’t do something for her or her guests. If you haven’t met a lot of the hubster’s family or he hasn’t met a lot of yours, setting up a website to introduce family members into your life is a good reason to create a website. Including bios of yourselves and your engagement story, quizzes about your experiences, or even photo albums will make your guests feel more involved in your relationship and that they know you better than they did before. I would call this category destination weddings, but there is too much stigma associated with that phrase. Instead, if you’re having a large amount of guests coming from far away to you for your wedding, you may want to consider setting up your wedding website to make guests feel comfortable with the location. You can feature accommodations, things to do, and local airports/taxis to help guests move around your wedding festivities. A hot trend in invitations are pocket fold invitations, which is an invite with “pockets” to put in enclosures containing information about the wedding. In some invites, you can find more pockets that you will find in women’s wallet (and that says a lot). If you’re one of those brides to be who wants a simpler invitation, save the date, or other stationary, you can always direct guests to “www.insertyournamehere.com.” On your website, guests can find all the information they’d need about your wedding without a lot of paperwork. Green, or environmentally-friendly, weddings are very popular as of late. If you’re looking to go paper free, a wedding website would become the hub to your planning spokes. You can send invites out electronically and request that guests RSVP to your website, learn about accommodations, and even create a community among guests on your website. There are many other good reasons for creating a wedding website. Bottom line is this: business-savvy brides mustthink strategically about allocating both their time and money when wedding planning. If a bride doesn’t have a good reason for creating a wedding website, she shouldn’t create one at all. What’s your reason for creating your wedding website? Share in the comments below.